Celebrate Halloween at The Oriental Hotels Legazpi and Leyte! Halloween only comes around once a year, it is a season enjoyed not just by kids but by adults too! As they say, it's one night where ghosts, witches, and fairies are especially active. Parties and celebrations are indeed more fun when you decorate your home with lots of scary stuffs to scare friends and guests who dare to visit your home. Kids will surely love visiting your home for the traditional the "Trick or Treat! ", fun games and of course sumptuous food! In line with this, The Oriental Hotels in Legazpi and Leyte will be having its annual Halloween celebration to the delight of their guests. It will surely be a lot of fun and surprises! Are you looking forward to a fun and thrilling Halloween this year? Moms, dads, and kids are invited to join the fun at The Oriental Legazpi and The Oriental Leyte this coming October 26, as it turns into a Zombie Zone. 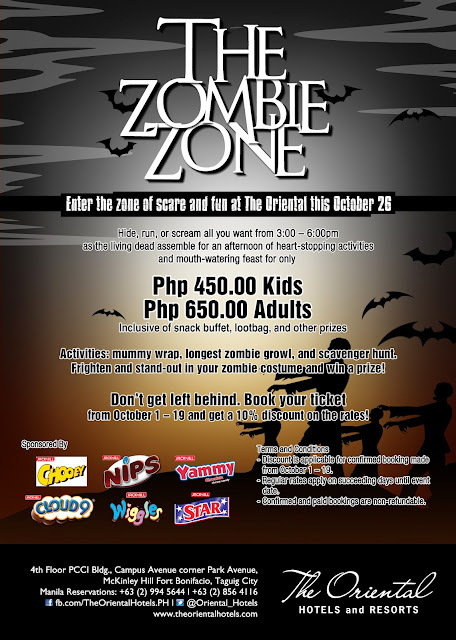 For only Php 450 per kid and Php 650 per adult, both kids and adults will get to enjoy an afternoon full of surprises and scare, as The Oriental offer heart-stopping games and mouth watering food to those who will get zombified. To make the event more spectacular, youngsters coming in zombie costume is in order. The Oriental team will choose the best costumes and one (1) boy and one (1) girl will get a chance to bring home a special gift. Many more amazing prizes are prepared just for this celebration. So don’t forget to bring a pumpkin, to be filled with exciting goodies. Hungry for more?Book as fast as you can and don’t get left behind. If you confirm your ticket reservation from October 1-19 you’d get 10% off the regular rates. For inquiries, call (02) 994-5644 or visit www.orientalhotels.com or LIKE their Facebook at www.facebook.com/theorientalhotels.ph. Come and celebrate this year's Halloween at The Oriental Hotels!